Take one part Roald Dahl, a pinch of Mysterious Benedict Society, and a dash of Lemony Snicket, then add a league of adventurous children, a little magic, and a centuries-old feud with witches, and you get this quirky and hilarious middle-grade series! 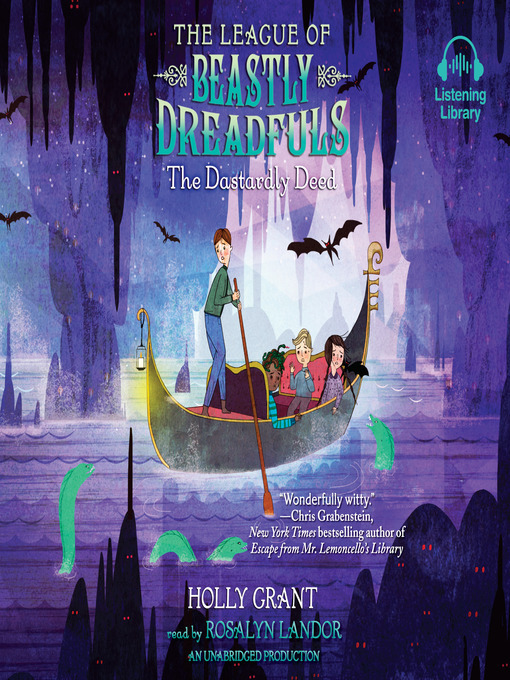 After their narrow escape from a NEFARIOUS kidnapping ring, Anastasia, Ollie, and Quentin (aka the League of Beastly Dreadfuls!) are looking forward to a relaxing vacation from DANGER! INTRIGUE! CATASTROPHE! Sadly, they're not going to get one. Because Anastasia makes the SHOCKING discovery that her family is at the heart of a centuries-old WAR with WITCHES, a war that began with the dastardly disappearance of Anastasia's very own grandfather. Can the league track down Anastasia's grandfather and find out who Anastasia really is? Gentle Reader, BEWARE! The trail of clues leads to spine-tingling surprises. Read on . . . if you DARE!